All living organisms consume energy, modify resources from the environment and produce waste. That is an inescapable fact of life. But in nature all material wastes are recycled as inputs to other living organisms. The only true waste is diffuse, low-grade heat. In order to create a truly sustainable economy we must mimic the ecosystem so that the waste of every household and business becomes resource inputs to other enterprises and the only waste produced is diffuse, low-grade heat from renewable resources like solar. 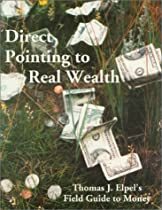 In Direct Pointing to Real Wealth author Thomas J. Elpel demonstrates that it is inevitable that we will create an ecologically sustainable economy. Tom turns conventional thinking on its head and out-lines steps you can take to increase your prosperity right now while closing the loop on waste and speeding the transition to a greener world. Direct Pointing to Real Wealth is an enlightened look at the nature of money. Discover how the economy is like an ecosystem and how money is a token we use to represent calories of energy in the ecosystem. Toms unique approach to money takes you beyond the numbers game to a direct examination of the laws of physics, biology, and economics. These laws are the same today as in the Stone Age, when people worked only a few hours per day and had much more leisure time than we do now. Whether you are raising a family or running a business, Toms book gives you a fresh new look at economics, ecology and how to achieve your Dreams. Break through perceived limitations to discover a world of prosperity and abundance!